Description: The new Companies Ordinance (Cap. 622) came into effect on 3 March 2014. While Cap. 32 has not been completely repealed except those provisions relating to winding-up and insolvency of companies and prospectuses. The Cap. 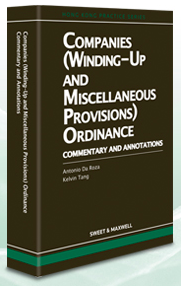 32 has now been re-titled as “Companies (Winding-Up and Miscellaneous Provisions) Ordinance”. This title is a must-have publication to examine each and every section of the remaining law, highlighting the key changes incorporated and amended as a result of the enactment of the new Companies Ordinance. The main focus of this Companies (Winding-Up and Miscellaneous Provisions) Ordinance: Commentary and Annotations including: 1. Prospectives of Companies registered here in Hong Kong; 2. Winding-Up of a Company; 3. Insolvency of a Company; 4. Director duties of care and disqualification; 5. Appointment of receivers and managers of insolvent companies; 6. Restrictions on the sale of shares; 7. Restrictions on the offers of shares for sale; 8. Prevention of evasion of the societies; and 9. For any other incidental and connected matters. Notable highlights for these commentary & annotations are: • Insightful commentary and annotations of all those 244 Sections of Cap. 32 which remain in force; • Select list of specified forms for use under Cap 32 regarding the Winding-Up and Insolvency of a Company; and • Briefing and consultation notes on the recommended improvements to the clarity and application of the Corporate insolvency and Winding-Up provisions.